There is a small island in the Mediterranean that seems to have had more than its fair share of invasions. The island is Menorca, one of the Balearics and now part of Spain. Back in 1756 it was ruled over by the British until the French arrived and took it from them. The French were led by a man named Louis-Francois-Armand de Vigneot du Plessis, Duc de Richelieu (1696-1788) who ordered a feast to celebrate the victory. His chef, realising he had no cream to add to the eggs to make a sauce, added vegetable oil instead and so was born mayonnaise named after the capital of Menorca, Mahon (or Mao in Catalan). 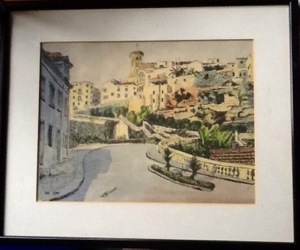 My next picture is a coloured print of that very road which may have changed little since the invention of mayonnaise. It has a monogram of what looks like VH and it is numbered 1/75. It only cost £1.95 which isn’t much to pay for such a timeless and historic view. In my case this is quite literally true because I spent quite a lot of my past in a foreign country. 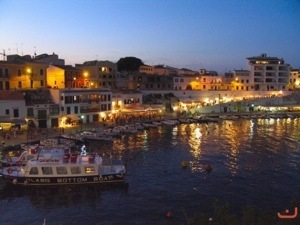 One of the places I lived for a while was Menorca, one of the Balearic Islands belonging to Spain. 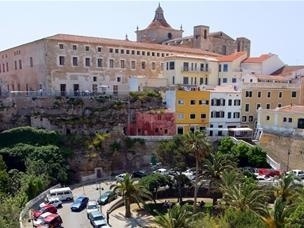 Menorca has an interesting and varied history having been occupied by almost everyone from the Greeks and the Romans to the British (with a rumour that Lord Nelson once set foot on it). There is a small town called Es Castell (the Castle) near the capital Mahon. When I lived there it was called Villa Carlos and when the English were there it was called Georgetown. One of the loveliest parts of Es Castell is a little bay/harbour called Calas Fonts with bars and restaurants set in to the rock face. Here it is looking really pretty at night. Ah, happy memories! But I digress…. 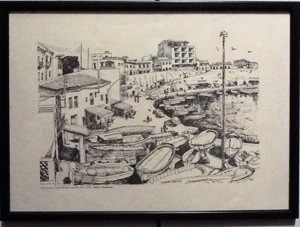 Here is a lovely pen and ink drawing done in 1976 by V Hankinson. I think it is a limited edition print although not signed. I was delighted to find it in a local charity shop and it only set me back £1.95. Not much to spend on all those memories.